8 × = 40 Required Please enter the correct value. The DJIA Index rose 75 points Wednesday on strong energy stock gains and improving confidence in first-quarter earnings. A strong U.S. dollar, winter weather, and a massive West coast port shutdown may not have affected companies in Q1 as much as previously expected. Shares of Netflix Inc. (Nasdaq: NFLX) are surging more than 12% in post-market hours on news that the company shattered earnings expectations. The S&P 500 Volatility Index (VIX), the market's fear gauge, declined 6% on the day. Markets rose and fear about poor quarterly earnings abated after the Federal Reserve announced in its Beige Book that the U.S. economy grew at a moderate or modest pace from mid-February through to the end of March. The report did indicate that some regions, like North Dakota, suffered a large number of layoffs in the energy sector and that a few manufacturing regions around the country were affected by a stronger dollar. Nonetheless, the report reassured the markets. Aside from positive earnings reports, the biggest news today came from Europe, where Mario Draghi said it will be full-speed ahead as he defended the central bank's stimulus efforts. In addition, the European Union formally accused Google Inc. (Nasdaq: GOOG, GOOGL) of practicing anticompetitive practices. The EU's competition commissioner said investigators are focusing on the Google Android operating system. The company could face fines of up to 6 billion euros, or roughly $6.4 billion. However, a settlement would be more likely and could drag on for years. Oil Prices Today: All 10 major S&P 500 sectors were up on the day, but the biggest winner was the energy index, which rose more than 1.7%. Oil prices continued to rise today on expectations that the United States will begin to see falling production, while unrest in the Middle East is raising the attention of speculators. Brent oil, priced in London, gained 3.2% to jump above $60 per barrel. WTI crude, priced in New York City, gained nearly 6% on production concerns to hit $56.39 per barrel. Stocks to Watch No. 1, DAL: Despite rising fuel costs, shares of Delta Air Lines Inc. (NYSE: DAL) gained 2.6% on news that it beat first-quarter profit expectations. Many companies in the airline and transportation industries are expected to report stronger profits on the back of cheap first-quarter oil prices. However, investors will want to keep a close eye on future moves to crude prices due to the impact on these firms' bottom lines. 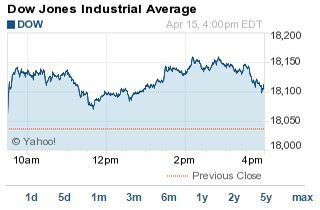 With the exception of American Airlines Group Inc. (Nasdaq: AAL), all other major airliners were down on the day. Stocks to Watch No. 2-4, XOM, CVX, BP: The surge in oil prices continues to benefit the world's leading multinational producers, which were up again on the day. Shares of Exxon Mobil Corp. (NYSE: XOM), Chevron Corp. (NYSE: CVX), and BP Plc. (NYSE ADR: BP) all gained more than 1.4% on the day. Stocks to Watch No. 5, BAC:Shares of Bank of America Corp. (NYSE: BAC) slipped more than 1.1% today despite a better than expected Q1 profit report. The firm announced per-share earnings of $0.36, besting analyst expectations of $0.29 per share. However, the stock declined on news that the bank reported a one-time $6 billion charge due to litigation. This is a very busy week of earnings for the financial sector, with Goldman Sachs Group Inc. (NYSE: GS) on deck for Thursday. Stocks to Watch No. 6, AAPL: Shares of Apple Inc. (Nasdaq: AAPL) were up about 0.3% today despite mixed news about the company's pending release of the Apple Watch. According to a survey by Reuters/Ipsos, roughly 6% of U.S. adults plan to buy the company's new smartwatch. That translates to roughly 15 million watches, but it is unclear if those who were polled will actually make that purchase.